You can always tell when the marathon movie awards season is approaching. Talk of movies going to Toronto, Telluride and Venice starts accelerating, campaign consultants start asking me what upcoming fall release contenders I may somehow have already managed to get an early look at, and the Hollywood Foreign Press Association has its annual dinner to hand out lots of money for worthy endeavors at their official Grants Banquet. True to form it was held last night at the Beverly Wilshire Hotel and according to brand new HFPA president Meher Tatna, this year more than $2.8 million in donations to a total of 55 institutions of one sort or another was dispersed. Most notably this time around, one of the recipients of a $200,000 grant came directly from a suggestion made in a Golden Globes speech in January: Meryl Streep, in accepting the Cecil B. DeMille Award, urged the HFPA to support the Committee to Protect Journalists, a natural fit considering the makeup of the organization. Tatna said Streep’s speech (which got lots of attention coming as it did just days before the inauguration of Donald Trump, a prime target of her remarks) inspired her and the group. Now it has put its money where its mouth is, a fitting and generous gesture as the HFPA celebrates 75 years and its Diamond Anniversary this year. There was less talk about Trump at this event than at the Globes or most other awards gatherings this past season, but host Chelsea Handler did get a great zinger in at the beginning of the presentation. “Tonight we celebrate the three things Donald Trump hates the most: foreigners, the press, and actually donating money to charity,” she said to big laughs from the crowd, which was filled with representatives of the many organizations winning grants from the cash rich HFPA, publicists eager to curry early favor in the upcoming season from the many Globe voters all in one room, and a celebrity lineup of presenters and accepters who may also just coincidentally have a movie or TV show that could be a Golden Globe contender. Among the latter were Armie Hammer, Bob Odenkirk, Chrissy Metz, Anthony Mackie, Elisabeth Moss, Matt Bomer, Patrick Stewart, Robert Pattinson, Chadwick Boseman, Kathryn Hahn, Ava DuVernay, Kumail Nanjiani and Dustin Hoffman to name a few. 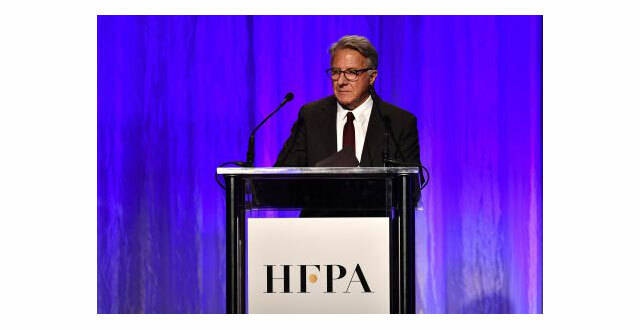 Hoffman accepted the annual check (this year, $350,000) for Martin Scorsese’s Film Foundation, which over the years has been the beneficiary of millions of dollars toward film preservation and restoration from the HPFA. That gift was preceded by a filmed message from Scorsese himself. In addition to restoring more than 90 films, HFPA grants have committed nearly $30 million since this practice was started in 1989, and more that 1500 scholarships. Additionally at this year’s Cannes Film Festival, the org donated a cool $500,000 to the International Rescue Committee. Among the many who benefit this year, DuVernay accepted a grant on behalf of The American Film Institute’s Directing Workshop For Women, while Hahn and Nanjiani welcomed a new grant this year for the Los Angeles LGBT Center and its Outset: Young Filmmakers project promoting at-risk LGBTQ youth with hands-on filmmaking experience. Another $10,000 grant went to helping Veterans in Film & Television, a worthy endeavor that gives support to military vets breaking into the film business after their (in many cases) numerous tours of duty. Entertainment was provided by Keala Settle, singing a powerhouse rendition of Whitney Houston’s “The Greatest Love Of All.” Settle, nominated for a Tony last year for her supporting role in Waitress, could be headed for Globe and/or Oscar recognition for her first big film role as the Bearded Lady in the 20th Century Fox holiday release The Greatest Showman which stars Hugh Jackman as P.T. Barnum. As noted in my coverage of Fox’s presentation at CinemaCon in March, Jackman was effusive in praise of Settle. Certainly her performance last night won’t hurt in continuing the buzz for the as-yet unseen film musical. I am told she has a Jennifer Hudson Dreamgirls-style show-stopper from the film musical’s score by Oscar and Tony winners Benj Pasek and Justin Paul. Among executives in the crowd at the Beverly Wilshire was Fox chairman Stacey Snider, who seems to be holding a hot hand this awards season with numerous Oscar possibilities — hopefully including the summer hit War For The Planet Of The Apes, which is truly epic and thought-provoking. Fox is taking their survival drama The Mountain Between Us starring Kate Winslet and Idris Elba to Toronto. Among other execs I saw were NBC’s Robert Greenblatt (still thrilled over Dear Evan Hansen’s Tony win, as well as all those Emmy nominations for This Is Us); Open Road’s Tom Ortenberg, who was praising its Thurgood Marshall drama Marshallstarring Boseman; Reigning Best Picture champ (Moonlight) A24’s David Fenkel and Daniel Katz , both understandably excited to be releasing their Cannes pickup The Florida Project, a real discovery of a movie; and Lionsgate’s Patrick Wachsberger who has Jake Gyllenhaal in TIFF World Premiere Stronger, and Julia Roberts November release Wonder in the mix. And so another season is knocking at the door.